When you join Monash Law, you have the opportunity to provide expert legal help to those who would otherwise slip through the cracks. 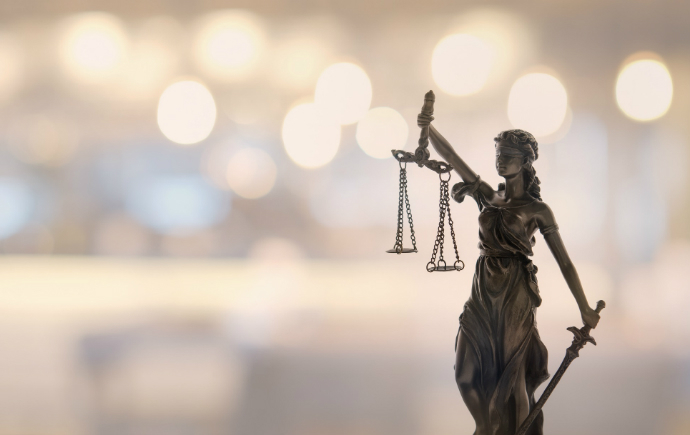 Clinical legal education not only develops practical legal skills for students but increases access to legal services and justice for people from adverse and disadvantaged backgrounds. Want to know what's really great? You can help the community while learning invaluable practical legal skills, gaining work experience (great for your CV), and you can do all this for credit towards your Law degree. We guarantee our students a place in the clinical legal education program to build their knowledge, experience, and confidence. 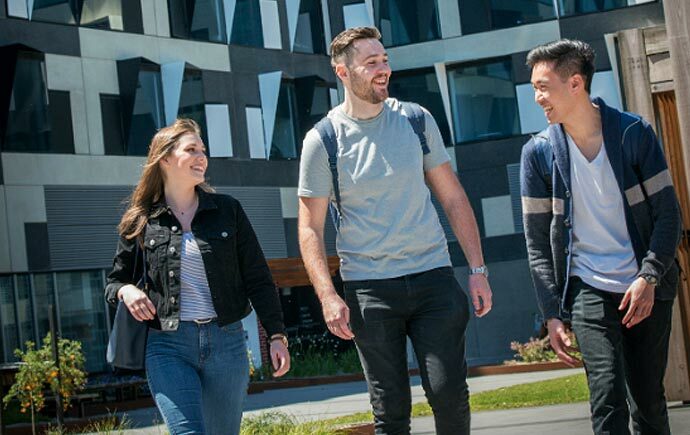 From 2018, Monash Law will be offering a guaranteed clinical education experience for all students who wish to incorporate a practical component credited towards their Monash Law degree. We are the first law school in Australia to offer a guarantee like this for our students. This reflects our belief in the transformative effect of experiential education. Providing all students, regardless of social or economic background, with pathways into the legal profession. Potential to be involved in meaningful and high-profile law reforms. For over 40 years we have been trailblazers in this space. We’re committed not only to continuing this important service into the future - we’re expanding it. At Monash Law we believe access to quality legal advice shouldn't be confined to those who can aford it. Tens of thousands of Victorians are turned away from community legal services each year. We believe this is unacceptable. At Monash Law we believe you should be work-ready, confident and equipped with life experiences when you enter the workforce. As a Law student, we know you are a wealth of knowledge. You also possess a boundless enthusiasm, dedication and creativity to find solutions to problems that others would simply declare 'too hard'. At Monash Law, we believe in innovation. We recognise opportunities to improve access to justice while also strengthening your education. Our Clinical Legal Education (CLE) program is the result of the above factors. CLE gives Monash Law students the opportunity to work in real community law clinics, which are operated by (or in association with) Monash Law. CLE places you with real clients who are seeking legal advice for the array of problems life can throw at you. 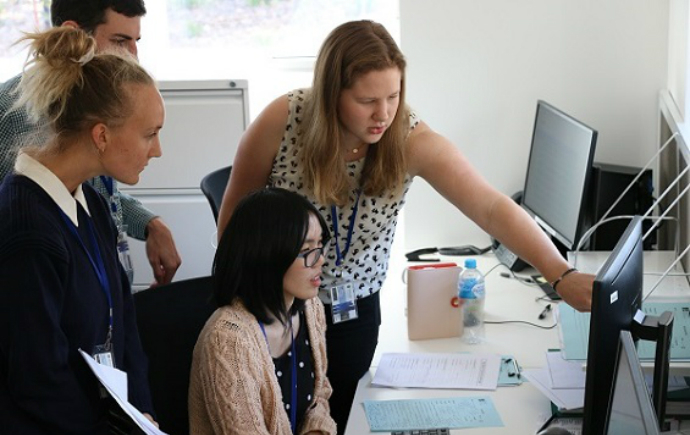 Working under the supervision of expert lawyers, Monash Law students learn new skills outside of the classroom; practical skills, including client relations and how to navigate the legal system. Your CLE experience as a Monash Law student is able to be credited towards your degree. Best of all, our CLE program contributes to the lives of people who have nowhere else to turn. 3. Earn credit towards your Law degree. For more than 40 years Monash Law’s CLE program has helped many members of our community. As a Monash Law student, you have the opportunity to be part of our future. Join us as we expand CLE to improve the lives of more and more people. As a Monash Law student you’ll learn how to be the best lawyer - and the best citizen - you can be. Outside the confines of a classroom and into the real world, our clinical legal education provides our students the opportunity to work with real people on real cases. A hallmark of Monash Law and highly regarded by legal professionals, our clinical legal education brings our law students to the forefront of the job market, before they even graduate. An understanding and appreciation of law’s fundamental purpose: to improve access to justice. We work with a variety of people from different backgrounds on real cases to achieve the best possible outcome. Providing advocacy on systemic issues, including advocating for policy and law reforms on issues of importance to the local communities we serve. Below are statistics on the assistance we provided to the community in the past year through our clinical legal education program. Membership of the Clinical Advisory Board is by invitation of the Dean and is drawn from alumni and distinguished members of the legal profession. 6. Make recommendations to the faculty to use the funds form the Susan Campbell Memorial Fund to provide access to the latest international and national clinicians and clinical research and to develop linkages between the clinical legal education program and the profession on a national and international level. The Honourable Justice Jennifer Coate - Judge, Family Court of Australia, Commissioner, Commonwealth Royal Commission into Institutional Responses to Child Sexual Abuse. In 2013, Justice Coate was appointed as a Judge of the Family Court of Australia and as one of the six Commissioners of the Commonwealth Royal Comission into Institutional Responses to Child Sexual Abuse. Prior to this, Justice Coate held a number of appointments including Judge of the County Court of Victoria, State Coroner of Victoria, the inaugural President of the Children's Court of Victoria and Senior Magistrate, Deputy Chief Magistrate, and Magistrate of the Magistrate's Court of Victoria. During her time as President of the Children's Court of Victoria, Commissioner Coate oversaw the establishment of the Children's Koori Court. Justice Coate has also worked as a part-time Law Reform Commissioner, a solicitor in private practice, a solicitor for the Legal Aid Commission of Victoria and in policy and research for the Victorian Government. At Wisewould Mahony Lawyers, Dominic leads a team which acts for the Victorian WorkCover Authority and the Transport Accident Commission, conducting public liability recoveries on behalf of these statutory insurers. Dominic holds Bachelors of Laws and Economics degrees from Monash and was admitted to practice in 1991. Bruce Dyer is a senior consultant in the corporate group at Ashurst in Melbourne having been a partner of the firm from 2008 to 2015. Bruce specialises in company law and governance, corporate, government, mergers and acquisitions. Andrew George has over 20 years of experience as a criminal lawyer and has been an Accredited Criminal Law Specialist since 1995. Andrew is a clinical graduate and was the former chairperson of the Buoyancy Drug Foundation and was a member of the committee of management fo the Public Interest Law Clearing House (PILCH) for over 10 years, including a period as Secretary. He as also been a volunteer at Springvale Monash Legal Service Inc. and the Brimbank Legal Service. Andrew spent 6 months in Papua New Guinea and assisted in establishing the first community legal service in that country. Kristine has a broad administrative law, commercial and equity practice. Her administrative law practice includes judicial review and merits review. IN addition to such litigation, she has advised government as to matters of legislative drafting and related issues. She is experience in professional disciplinary matters and related processes, mostly in relation to the legal profession. She has a substantial appellate practice in both State and Federal jurisdictions. In addition, Kristine has a long standing interest in access to justice issues and is a member of the Bar Pro Bono Committee and the Victorian Executive of the International Commission of Jurists. She is accredited by the Victorian Bar as an Advanced Mediator, and a member of the national panels of expert mediators maintained by the Office of the Mediation Advisor under the Franchising and Oil Industry Codes of Conduct. Sonia Parisi is a principal practitioner in the legal assistance sector, with experience in local, state and national government in Australia and the United Kingdom. She is currently the Acting Director of Victoria Legal Aid's Legal Practice Directorate. Sonia completed the clinical education program as an undergraduate. Dr Kate Seear - Academic Director, Springvale Monash Legal Service Inc.
Ms Kristen Wallwork - Executive Director, Springvale Monash Legal Service Inc.
Our experiential learning program is available for both our undergraduate and postgraduate students. You will be working directly with clients, gaining 'real life’ experience and skills that cannot be taught in the classroom. Practical skills in mediation, negotiation, collaboration, arbitration all essential for your future capacity as a lawyer. You will also begin to understand the boundaries between a lawyer’s role and those of other human services. And you will gain communication skills and emotional intelligence - essential for effectively attracting, representing and keeping clients. 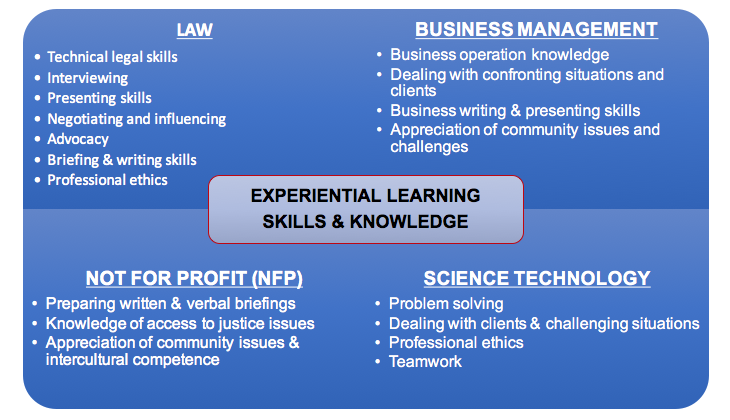 Our experiential learning program provides students with an insight into what an average day-to-day looks like for a real-life working lawyer. Students will manage between 10 to 12 client files over a 17 to 19 week period; the community legal centre becoming your defacto classroom for this period. Springvale Monash Legal Service is open five days and four evenings per week so you may be required to do an evening shift. You can apply for our experiential program from your 3rd year of study, as an undergraduate student. Juris Doctor students can apply for their clinical legal education program in their 2nd year. 2019, the following units in the Clinical Legal Education programs are offered in three separate clinical periods (CPs) to undergraduate students. Successfully completed the prerequisite units according to the commencement year. A valid working with children check (Volunteer) under the counsellor category. Student should read the LAW4328 Professional Practice Unit Information before undertaking the application process. Complete the LAW4328 Application Form via InPlace, using the InPlace Application Instructions. Successful applicants will be notified by email within 7 to 10 days of application closing date. Students will be enrolled into the unit by Student Services. Students' results in previous units. Generally, places will only be given to high performing students. How close the student is to completing their degree. Preference is given to students who would be completing Professional Practice towards the end of their degree. How many hours of paid work the student is doing. If a student is doing more than 20 hours per week of paid work, then it normally they would not be accepted into the unit. Students may be contacted to discuss this further regarding flexibility. How many other units would be taken with Professional Practice. If the student is doing more than three other units as well as Professional Practice, they would normally not be accepted into the unit. If a student speaks languages other than English. If a student has had relevant community sector experience. The Convenor of Legal Practice Programs makes the ultimate decision of whether a student is offered a place in the program, subject to the above factors and his/her discretion. Student should read the LAW4330 FLAP unit information before undertaking the application process. Please note that it is highly recommended that students take LAW4177 Introduction to family law or LAW4163 Parents, children and the state before applying. Complete the LAW4330 FLAP Application Form via InPlace, using the InPlace Application Instructions. *Dates are inclusive of a two day Introductory Program and two change over weeks. ** Students may be required to attend an orientation day for LAW4803. Date and time to be advised at a later date. Clinical units are subject to their own set of Discontinuation Dates. Students should check these before deciding to withdraw from a unit. Frequently asked questions about all the Clinical placements. Please read through the information below before embarking on the application process. Proof of application for a volunteer level (free) Working With Children Check. Complete the LAW5050 Application Form. Upload the LAW5050 Application Form via InPlace, using the InPlace Application Instructions. Students will be enrolled into the unit upon acceptance of the offer. Students must read the unit information before applying. How close the student is to completing their degree. Preference is given to students who would be completing Professional Practice (JD) towards the end of their degree. How many other units would be taken with Professional Practice (JD). If the student is doing more than three other units as well as Professional Practice (JD), they would normally not be accepted into the unit. It may be necessary to look at enrolments in more than one trimester if the clinical period overlaps two trimesters. Read about the success of Monash Law's alumni community through our experiential learning program. Find out about the types of clinics we have available and what they offer.